Villa Kristy Junior nestles somewhere along a track after leaving the Amizmiz road and hides in the heart of a park of olive trees. Nearby, you will discover villages and breathtaking views of the Atlas. Marrakech airport is 10km and the center of Marrakech about 15-20 minutes by car. 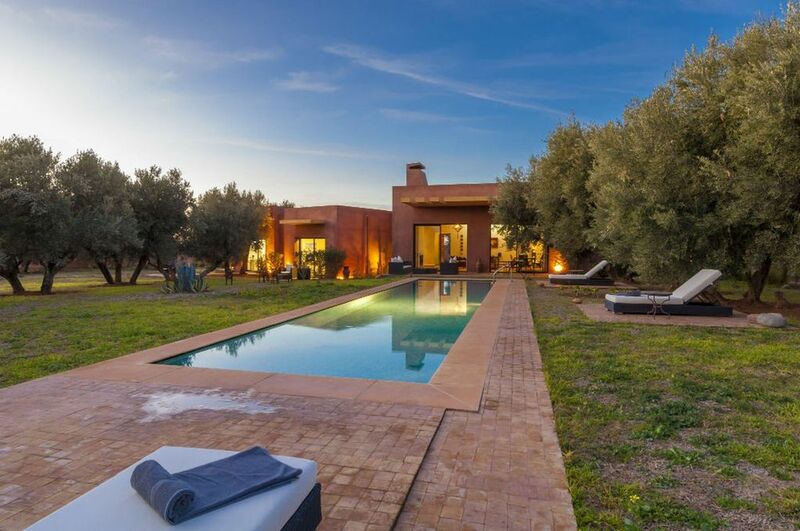 The Villa Kristy consists of two bedrooms, two bathrooms, a very large living room and an open kitchen and of course a private pool, large volumes characterize the villa. On entering we discover a large living room dining room where enthroned in the center, a fireplace and a large table, this room directly overlooking the pool and terrace. A Moroccan chef will introduce you to Moroccan cuisine, subtle and spicy. have mined objects during their travels in different regions of Morocco, of Moroccan inspiration with some contemporary touches. The decoration (identical in all rooms) is precisely dosed. the bathrooms are equipped with one or two washbasins and decorated with mosaics. Si vous rechercher un havre de paix je ne peux que vous conseiller la villa Kristy ! vous serez merveilleusement accueillis par 3 hôtes qui feront tout pour que votre séjour soit le plus agréable possible, et c'est mission réussie !!! une mention spéciale pour les repas qui sont excellents, variés, sain et accessoirement gargantuesque !! une adresse à conserver, mais surtout à partager ! !